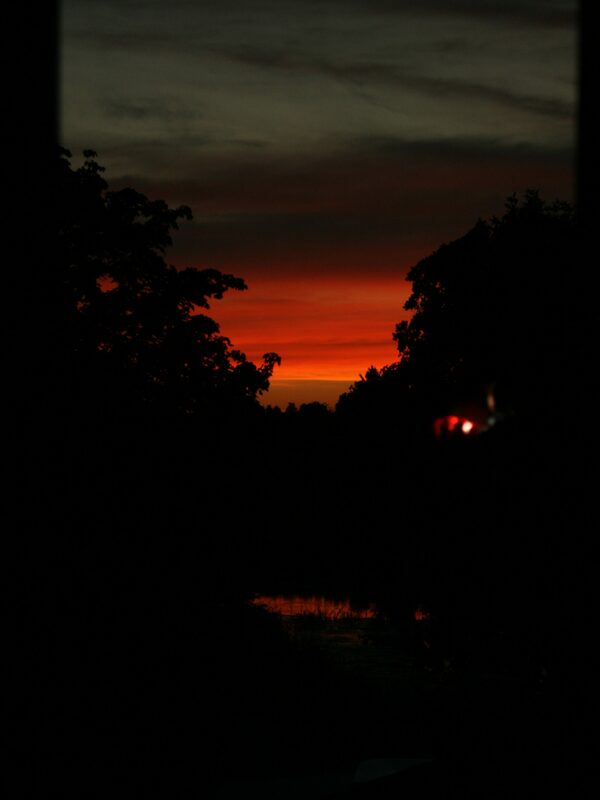 The sun sets on summer vacation. I love Fall. The cool weather, cozy clothes, pumpkin spice-everything. And, most importantly, back-to-school. After 9 (! Seriously who schedules these things?) weeks of being a full-time mom, I will once again be able to write for more than five minutes at a time, check into my social media accounts without an audience (who’s that person? go back up, I want to see that picture!) and leave the house alone. Last year it was easy to jump into work. With a deadline of 60 days to decorate and write-up 40+ cakes, there was no time to lose. But this year I have no deadlines, except the ones I make myself (at least for the first few weeks). This year I’ve decided to ease myself in. I’m already trying to increase my writing time (as much as I’m able to, with three kids at home): allowing the kids to watch a little TV so I can edit a chapter (now that summer’s almost over, I don’t have to stress about setting up bad habits), and getting up even earlier to write before everyone’s up. On the flip side, I have some things I’d like do once the kids go back, too. Like sit in a café, alone (I’ll bring a notebook for brainstorming), walk in the woods by our house, alone (with my camera for potential blog photos), and just watch an episode of bad TV (or three). While these things may or may not contribute to actual writing, hopefully they can help refill the creative well, which in my mind is almost as important. What about you? Are you counting the days until the kids go back? Does back-to-school equal back-to-work? If so, how do you prepare yourself to get back in the groove? This past weekend I had the pleasure of doing a book signing at Chapters Yonge & Eglinton in Toronto. It was my first just-signing (I did a demo and signing back in May in Ottawa) and it was lots of fun. The staff were wonderful and helpful, especially Maria, who gave me lots of great tips on making myself noticeable and kept sending prospective readers my way. And, of course, my childhood friend Christie, one of the managers there, who helped organize the whole thing. 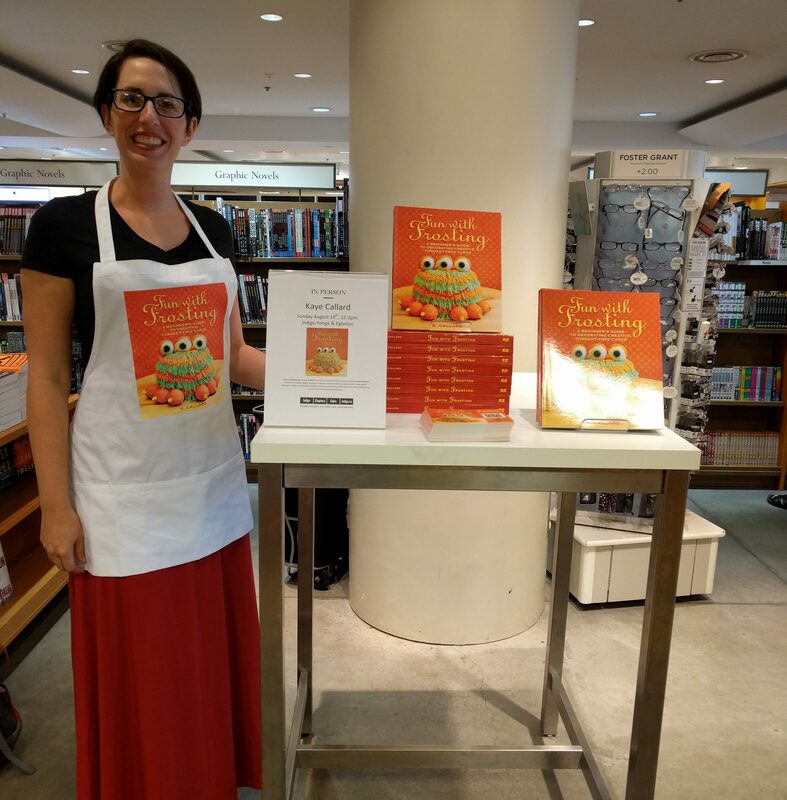 It was a quiet day in the store, but I had a few great conversations about baking, helped a girl with allergies find a few work-arounds, and talked to a fellow aspiring children’s fiction author about the comparative merits of SCBWI and CANSCAIP. Even better, I had a few old friends show up and keep me company, including one who would randomly flip to a page in her copy of my book as people walked by and ooh and ahh over designs. Gotta love supportive friends! At the end, I signed the remaining copies in the store, so if you’re in the Toronto area and looking for a signed copy, head over to the Yonge & Eglinton Chapters. After all, it’s never too early to start your holiday shopping (yes, I have already started – I am totally one of *those* people). Hope your week has been as exciting as mine! 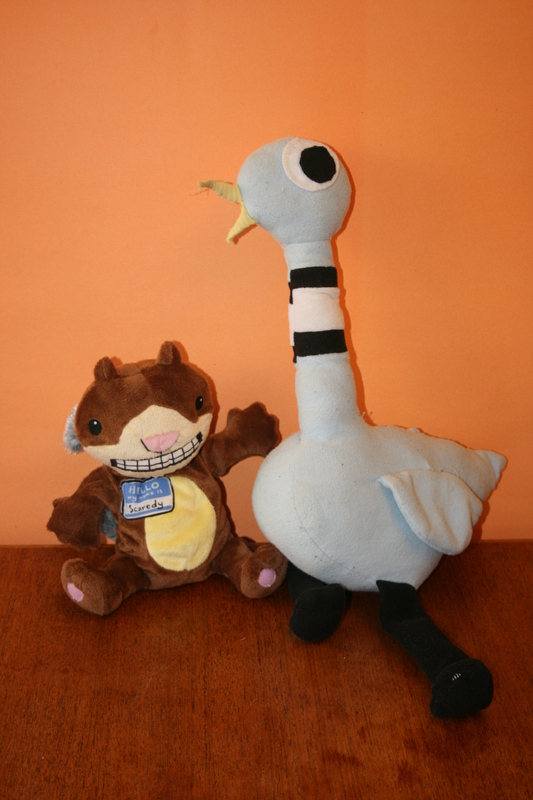 Scaredy Squirrel and the Pigeon are such great characters that we have stuffed versions of them to play with! Last week I wrote about my struggles with rhyme. This week I thought I’d focus on another of my struggles: character-driven picture books. These are books (usually series, in fact) based on a well-defined character, whose personality drives the story forward. You could put your character into any story, and know, from their personality alone, how the story would unfold. Bri has been encouraging me for a while to try my hand at writing one, but every time I try, I end up with a plot-based story instead, or at best, stories where the character may drive that particular story, but where another plotline wouldn’t make any sense for them. But recently my boys discovered they can read Mo Willems’ Elephant and Piggie books – and we’ve been reading two a night, every night, ever since – and that kind of repetition awoke something in me. So I decided to try my hand at my own comic duo – and I hit gold. For me, the interplay between the two characters was what drove the story, and I was able to scribble down four different stories with them driving the action! Are the stories derivative? Are they funny? Are they unique enough to make it in this competitive market? Are they even good enough to send to Bri one day? Only time and my critique partners will tell (although my first round of crits has already come back with positive results. Yay!) But for now, I’m in love with them, and hopefully one day Bri (and a publisher) will be too. What about you? Do you prefer character- or plot-driven books? What are your favourite examples? Tell me in the comments. 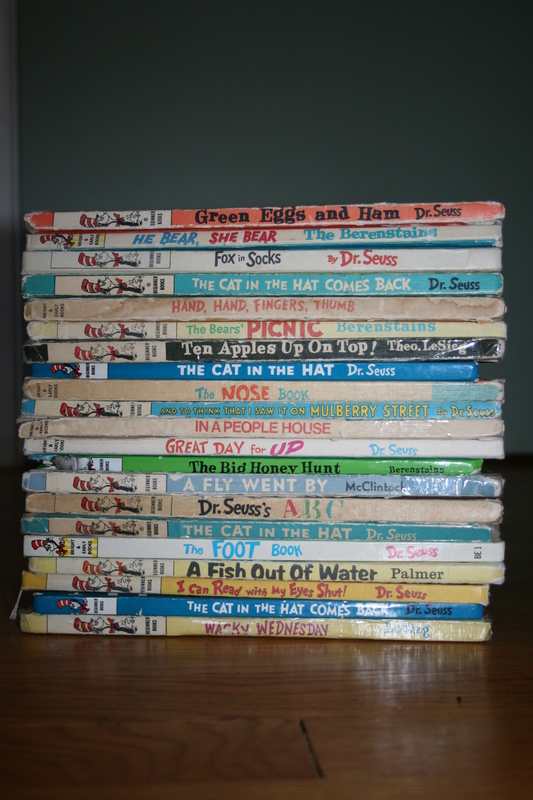 My stack of childhood books – is it any wonder I love rhyme? As a writer, I know agents and editors are tired of these, too. That’s why so many have “No Rhyme” edicts. Plus, there’s also the translation issue to contend with – rhyming books are much harder (if not impossible) to translate, cutting off potential income/sales for a book. For a rhyming book to sell these days, it has to be special: strong rhymes, preferably unusual ones (sat/cat/hat/mat just doesn’t cut it anymore), with impeccable rhythm, all about a unique idea. And if your story can’t hit those high standards, well, then, it’s better off in prose. And, so far, my rhyme doesn’t cut it. But still, I keep coming back to it, like some kind of rhyme junkie. I’ve tried playing with some new forms lately, including a more staccato, almost rap-like story, but nothing strong enough to show to crit partners. However, of the 4 1/2 PBs I wrote for my mini challenge, only the half-book was written in rhyme. And, to be honest, I think that’s a large part of why I didn’t finish it. The rhymes just didn’t want to come, and no matter how I rearranged my sentences, I just couldn’t make them work. The rhyme stumped me. So, for the other four books, I didn’t even think about rhyming. And those books were definitely stronger for that choice. Is rhyme dead? I don’t think so. There have been some great rhyming books lately: Josh Funk’s Lady Pancake and Sir French Toast, Corey Rosen Schwartz’s Ninja Red Riding Hood, and Paul Czajak’s Monster Needs a Party, to name just a few. In the end, I think it comes down to the age old (but too good to be clichéd) adage, “write what you love.” If a story calls out to be written in rhyme, write it in rhyme. But it doesn’t hurt to try your story out in prose as well – that way you can discover for yourself whether the rhyme is really necessary, or just there because you think it should be. What about you? Would you, should you write in rhyme? Do you do it all the time? Is sing-song rhythm in your head? Or do you write in prose instead? Tell me about it in the comments. *Bonus points if you caught my Princess Bride reference.